My friend Shirley has collected cookbooks, recipes, and old food magazines for many years, which makes us kindred spirits in our cooking lives. Shirley and I met many years ago at a cooking competition. Shirley is known to all her friends as the Grande Dame of contests. She could probably tell you about almost every cooking contest since the ’60’s, and probably even earlier. 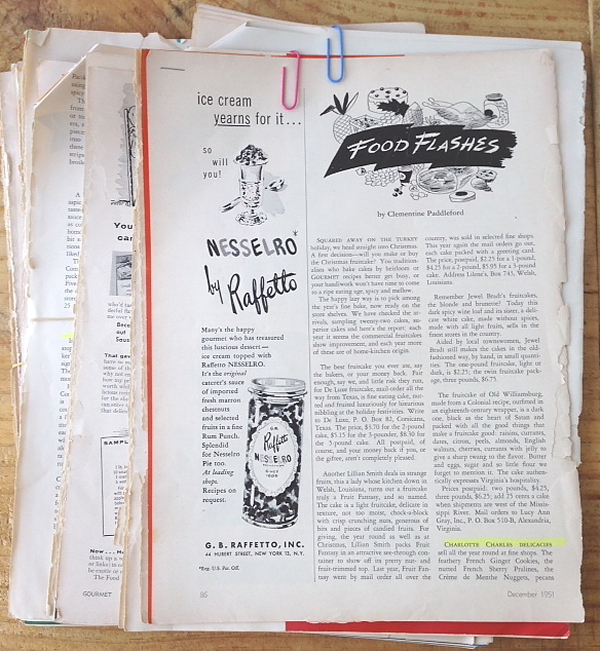 But sometimes there comes a moment when all collections need to be sorted and cleaned out, and I was the lucky recipient of some of Shirley’s Food Flashes articles from Gourmet magazine of long ago. How I miss that publication. I was thrilled to open her over-stuffed envelope with all the yellowed, dog-eared, and ripped pages of Gourmet. All of the pages were of the Food Flashes from Clementine Paddleford, the subject of many of my blogs in the last couple years. Clementine is considered America’s first traveling food writer who loved finding out everything new on the culinary scene in every part of the country. In her Food Flashes articles, she also informed us of what delicacies could be mail-ordered, or if you happened to live in the area where items were available, she would tell you where to locate the store. Clementine may have been one of the first to report nationally on a new corn chip called “Fritos,” which she said means “fries” in Spanish. She informed her readers that they were so good, you couldn’t stop at one. In fact, Clementine went so far as to say that Fritos were the most popular munch item “since salt was put on the peanut.” It seems that a Texan named C.E. Doolin walked into a San Antonio cafe and picked up a sack of corn chips to nibble with his coffee. He bought the recipe for $100 and the rest is history. Searching through all of Clementine’s reports, I came across interesting facts such as when Stephen D. Carr of Carr crackers came to the USA in the ’50’s to observe American biscuit tastes and buying habits. Clementine said she loved the crackers, but the tin was too hard to open, and she gave step-by-step instructions on the process required to open it! She shared another story of a Mrs. Florence Day, a New York City housewife who developed a delicious confection made of ground dried fruits (apricots, dates, and raisins), blended with honey, shaped into little balls and then rolled is sesame seed. Mrs. Day named them “Apridates,” and made them available by mail order. Another New York City housewife mail ordered her famous strudel from an old family recipe. 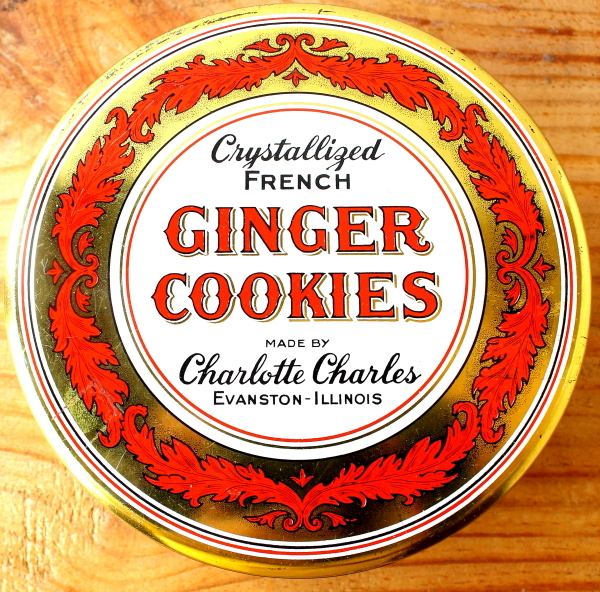 One story that caught my attention, because it was about a woman and her products from nearby Evanston, Illinois, was a line of delicacies from Charlotte Charles. Items included French Sherry Pralines, Creme de Menthe Nuggets, Napoleon Rum Cakes, chocolate Brandiocas, spicy Alpine Wine Sticks, brandied fruitcakes, plum pudding, and Crystallized French Ginger Cookies. In 1935, Mrs. Melanie Bouchelle McCarthy, an Evanston housewife, was playing cards with some friends as they discussed how women could help their families financially during the Depression. The phone rang and it was a friend who was trying to sell her fruitcakes to make money. “I would never ask a friend,” said Mrs. McCarthy, “but I would sell my own fruitcake commercially.” One of the card-playing women bet her $50 that she couldn’t do it. Mrs. McCarthy took the bet seriously. Collecting recipes had been a long time hobby of Melanie McCarthy, and she opened her over 300-year-old cookbook from the house of a woman named Charlotte Charles, who was a cook famous in the time of Napoleon. Mrs. McCarthy found the recipe for a fruitcake that she had been baking at Christmas for over twenty-five years. She baked a cake and carried it to a popular Chicago department store that had a grocery section. The buyer flatly said no, saying that the store’s 1,800 pound annual holiday order was made by a firm that they had dealt with for decades. “Just take a bite,” urged Mrs. McCarthy. The buyer declared it the best fruitcake she had ever tasted. Mrs. McCarthy won her $50 bet and the annual order of 1,800 pounds of fruitcake. The other products followed. 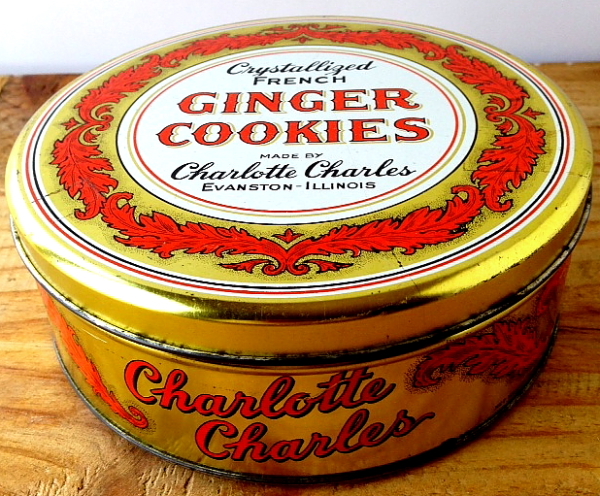 I became intrigued with the Charlotte Charles story and found one of the original tins online. I just wish I could have tasted those ginger cookies. Well what a nice surprise, Debbie! I guess I should have been ‘neater’ when ripping out those pages! Hadn’t thought of that … as I always hurry! Happy you enjoyed and your posting was fun to read. Now I have my Chocolatier magazines to go through (but probably not until winter! Shirley, ripped, dog-eared, and yellowed are my favorite things to find in old cookbooks and magazines. It means someone loved it! Thanks, Mary! So glad you found me. I’ll send you my email address. I would love to see your tin!